Future of Single-Dealer Platforms: SIs, MTFs or OTFs? An excellent article in Risk.net covered also in FXWeek, looks at the future of Single-Dealer Platforms under MiFID II and discusses the options for bank platforms. Initially, the SI regime seems obvious, as they can deploy their own capital, and trade with clients on a bilateral basis, which is what most SDPs currently do. Regulation is driving change in capital market structure, and as highlighted in the future of investment banking, banks continue to move towards a ‘capital-lite’ business model, as they seek to ‘optimise’ use of and return on capital. The introduction of mandatory trading and clearing for standardised swaps (SEFs in US and OTF and MTFs in Europe) has resulted in higher capital charges for OTC bilateral trades, and reduced the appetite of banks to warehouse and hold inventory which is moving more banks towards a ‘capital lite’ model. This is the backdrop to the announcement that JP Morgan the setting up a 150 strong fixed income agency execution desk called JP Morgan Execution Services (JPMES), to run alongside its principal trading operations. Last week I attended the Association for Financial Markets in Europe (AFME) 9th annual European Market Liquidity Conference. As always with AFME, there had some thoughtful speakers and topical panel discussions, as well as providing good forum for networking opportunities (including providing for the conference iPad’s pre-loaded with delegate names allowing you to reach out to them and make contact). Liquidity issue, what liquidity issue? * Establishment of Organised Trading Facilities (OTF) – restricted to non-equities, such as interests in bonds, structured finance products, emission allowances or derivatives. * Curbs on High-frequency algorithmic trading: would have to have effective systems and controls in place, such as “circuit breakers” that stop the trading process if price volatility gets too high. Just finished listing to an interesting webcast on Global OTC market reforms, and where next after the US and SEFs? Celent analyst Anshuman Jaswal, gave overview of market, SEF volumes to date, and possible differences in regulatory treatment and approach in Europe and Asia. Some key points form slide deck and a couple of slides below. 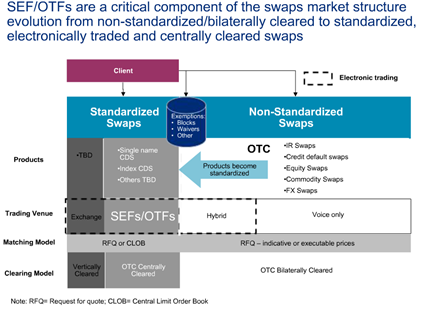 SEF and OTFs are critical components in evolution of the market from OTC non-standardised bilaterally cleared to standardised electronically traded and centrally cleared swaps. GreySpark has just released the results of their Annual e-Commerce Report: ” Trends in e-Commerce and Electronic Trading 2012″. Risk.Net has an interesting article today (extract below), quoting MEP Kay Swinburne, talking about modifying Mifid to accommodate systematic internaliser (SI), which has implications for Single Dealer Platforms. “We think we can make the systematic internaliser (SI) category work for single-dealer platforms,” she says. 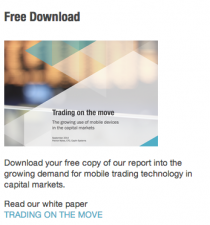 SIs allow trades to be executed against the owner’s proprietary capital, and are not required to involve multiple market-makers – but they are not recognised by Mifid as a platform on which standardised OTC derivatives can be executed. Swinburne hopes to change that.